Growing up as a child with severe food allergies and dietary restrictions, I envied the kids and parents that could pick up baked goods from any bakery or store. Staring at the bakery section in the grocery store, I wished I could pick something. Anything. But seeing the giant chocolate chip cookie sitting next to the piece of cake with peanuts sprinkled on top, it was always clear that bakeries were not safe. My mom would always try to supplement bakery items with prepackaged cookies or sweets that were allergy safe, but of course it’s not the same as a chocolate chip cookie fresh out of the oven. So a couple of years ago when I found the allergy-friendly bakery, Sensitive Sweets, it was as if the clouds had parted, and the heavens opened up. Having severe food allergies, I never thought I would be able to walk into a bakery, and have my choice from every single item. 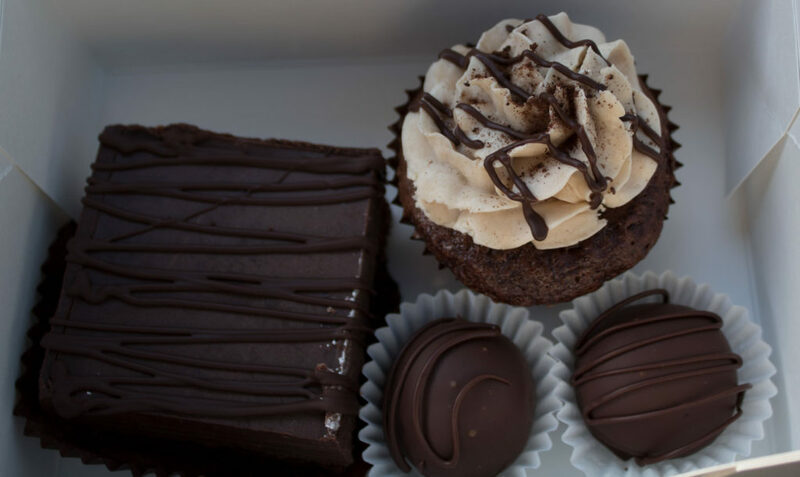 Sensitive Sweets is located in both North Orange County and South Orange County (even if you live a distance away, it is completely worth the trip). You can also order their goodies online! The bakeries are dedicated nut-free and gluten-free facilities and the baked items are free of gluten, dairy, eggs, soy, peanuts, tree nuts, and sesame. You wouldn’t know this by the taste of all of their sweets, even family and friends that do not have any dietary restrictions love and enjoy the desserts from Sensitive Sweets. My favorite chocolate sweets, a brownie, cookie dough truffles, and a mocha brownie! Yum! Now, for my suggestions when picking out their yummy desserts. First and foremost, the cookie dough truffle is INCREDIBLE. I love chocolate and I love cookie dough, so this is the perfect dessert for me. The remedy bar is half brownie, and half cookie, and is the perfect remedy for food allergies (this is my husband’s favorite dessert). Basically I highly recommend anything with chocolate. I cannot say how thankful enough I am to Sensitive Sweets for giving me the opportunity to feel like a kid again and get my choice of any delicious sweets in the entire bakery! I highly recommend you go and visit the bakery, or order online if you are not close enough! You can visit them at sensitivesweets.com. Just stumbled upon your blog today and am so appreciative of all your tips and recipes!! I also love that a bakery like this exists – must make a trip up there soon! Thank you so much for the sweet comment! I am so happy to be sharing all of the information I can. Having allergies is tough, so I hope this blog can help as many people as possible!